Created by David Clubb of RenewableUK Cymru - David's goal in the early 2010's was to get all sustainability, holistic and community enthusiasts together (informally) to discuss their ideas, aspirations, projects - so that potential stronger links can be developed across all our Cardiff communities. 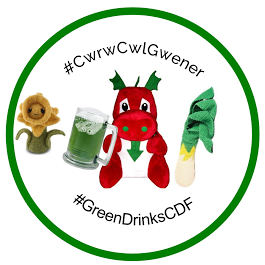 Green Drinks Cardiff was developed as part of the national UK Green Drinks network initiative!! Main Facebook Cardiff green Drinks page! Since the relaunch by Share Cardiff / Repair Cardiff / Cardiff Transition community support organisations - it has seen a recent resurgence as we go into the 2020's and brought together many sustainability enthusiasts together! New friendships created, new professional associations forged, more ideas shared ….. the Green Drinks has flourished. Please do come and join us - everyone is welcome! At Salvation Army (where Fanny Street and May Street Connect) off Crwys Road near the Co-Op Crwys. Come and bring your broken items – we can fix many things! Bring it in and let us have a look at it !! What is Repair Cafe about? Repair Cafés are free meeting places and they’re all about repairing things (together). In the place where a Repair Café is located, you’ll find tools and materials to help you make any repairs you need. On clothes, furniture, electrical appliances, bicycles, crockery, appliances, toys, et cetera. You’ll also find expert volunteers, with repair skills in all kinds of fields.